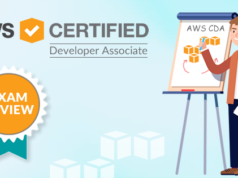 Preparing for the AWS Certified Solutions Architect Associate Exam (AWS CSAA) to become an AWS Certified Solutions Architect? Here we’ve brought FREE AWS Solutions Architect Associate Exam Questions for you so that you can prepare well for the AWS Solution Architect Associate exam. If you’ve already passed the AWS CSAA exam and now preparing for the AWS Certified Solutions Architect Professional Exam, check out Free AWS CSAP Exam Questions. Or if you are preparing for the AWS Developer Associate exam, check out Free AWS Developer Associate Exam Questions. AWS Solutions Architect Associate exam is for those who are performing the role of AWS Solutions Architect with at least one year of experience in designing scalable, available, robust, and cost-effective distributed applications and systems on AWS platform. Defining a solution with the use of architectural design principles based on the customer requirements. Providing guidance for the implementation on the basis of best practices to the organization over the project lifecycle. In simpler terms, AWS Solutions Architect Associate exam helps the AWS Architect to demonstrate his knowledge of architecting and deploying robust and secure applications on AWS platform using AWS technologies. 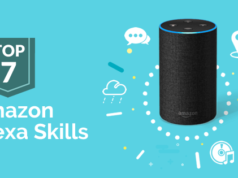 While preparing for any of the AWS certifications, you may find a number of resources for the preparation such as AWS documentation, AWS whitepapers, AWS books, AWS Videos, and AWS FAQs. But the practice matters a lot if you are determined to pass the exam in the first attempt. So, our expert team created a number of AWS Solutions Architect Associate exam questions that we are presenting in this blog not only with the correct answers but also with the detailed explanation. The same pattern we follow in our AWS Certified Solutions Architect Associate practice exam (AWS CSAA practice exam) so that you could understand well which option is correct and why. Try these AWS Solutions Architect Associate exam questions now and check your preparation level. 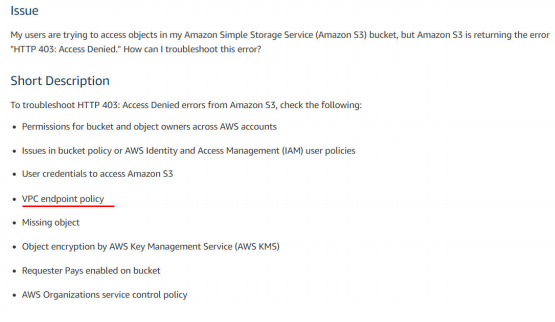 Let’s see how many of these AWS Solutions Architect questions you can solve at Associate-level! 1. You are planning to build a fleet of EBS-optimized EC2 instances for your new application. Due to security compliance, your organization wants you to encrypt root volume which is used to boot the instances. How can this be achieved? A. Select Encryption option for the root EBS volume while launching EC2 instance. B. 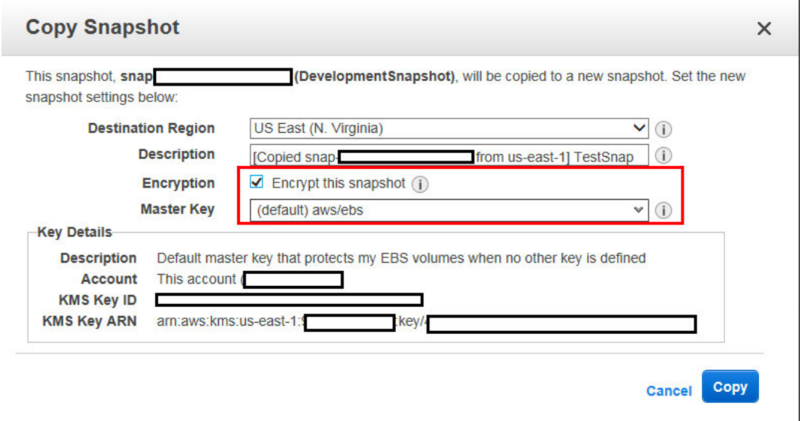 Once the EC2 instances are launched, encrypt the root volume using AWS KMS Master Key. C. Root volumes cannot be encrypted. Add another EBS volume with encryption option selected during launch. Once EC2 instances are launched, make encrypted EBS volume as root volume through the console. D. Launch an unencrypted EC2 instance and create a snapshot of the root volume. Make a copy of the snapshot with the encryption option selected and CreateImage using encrypted snapshot. Use this image to launch EC2 instances. When launching an EC2 instance, the EBS volume for root cannot be encrypted. You can launch the instance with unencrypted root volume and create a snapshot of the root volume. Once the snapshot is created, you can copy the snapshot where you can make the new snapshot encrypted. 2. Organization XYZ is planning to build an online chat application for their enterprise level collaboration for their employees across the world. They are looking for a single digit latency fully managed database to store and retrieve conversations. What would AWS Database service you recommend? 3. When creating an AWS CloudFront distribution, which of the following is not an origin? Explanation: AWS Lambda is not supported directly as the CloudFront origin. However, Lambda can be invoked through API Gateway which can be set as the origin for AWS CloudFront. A. A subnet can have multiple route tables associated with it. B. A network ACL can be associated with multiple subnets. 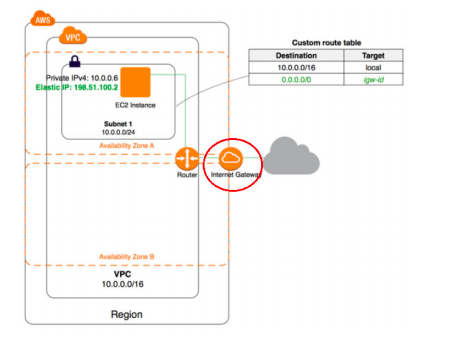 C. A route with target “local” on the route table can be edited to restrict traffic within VPC. D. Subnet’s IP CIDR block can be same as the VPC CIDR block. Option A is not correct. A subnet can have only one route table associated with it. Option C is not correct. 5. Organization ABC has a customer base in US and Australia that would be downloading 10s of GBs files from your application. 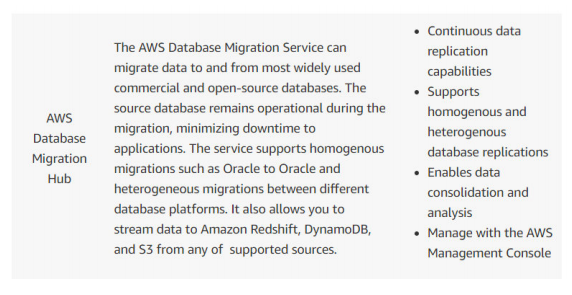 For them to have a better download experience, they decided to use AWS S3 bucket with cross-region replication with the US as source and Australia as the destination. They are using existing unused S3 buckets and had setup cross-region replication successfully. However, when files uploaded to US bucket, they are not being replicated to Australia bucket. What could be the reason? A. Versioning is not enabled on the source and destination buckets. B. Encryption is not enabled on the source and destination buckets. C. Source bucket has a policy with DENY and role used for replication is not excluded from DENY. D. Destination bucket’s default CORS policy does not have source bucket added as the origin. When you have a bucket policy which has explicit DENY, you must exclude all IAM resources which need to access the bucket. 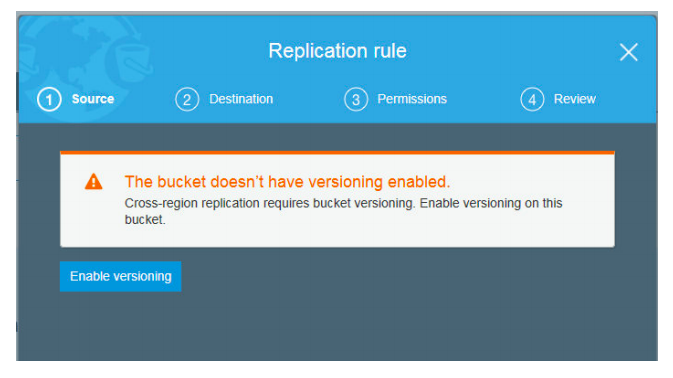 For option A, Cross region replication cannot be enabled without enabling versioning. The question states that cross-region replication has been successfully enabled. So this option is not correct. 6. 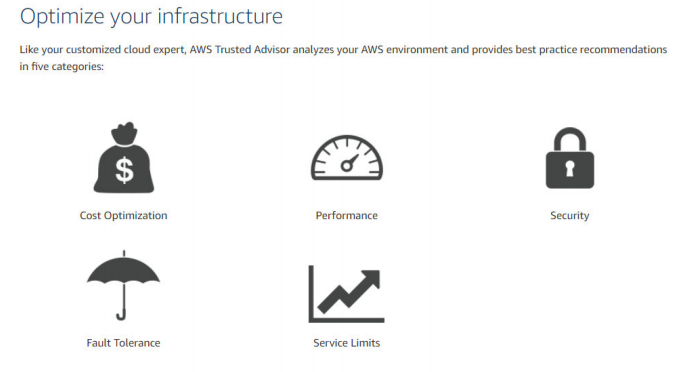 Which of the following is not a category in AWS Trusted Advisor service checks? 7. Your organization is building a collaboration platform for which they chose AWS EC2 for web and application servers and MySQL RDS instance as the database. Due to the nature of the traffic to the application, they would like to increase the number of connections to RDS instance. How can this be achieved? B. 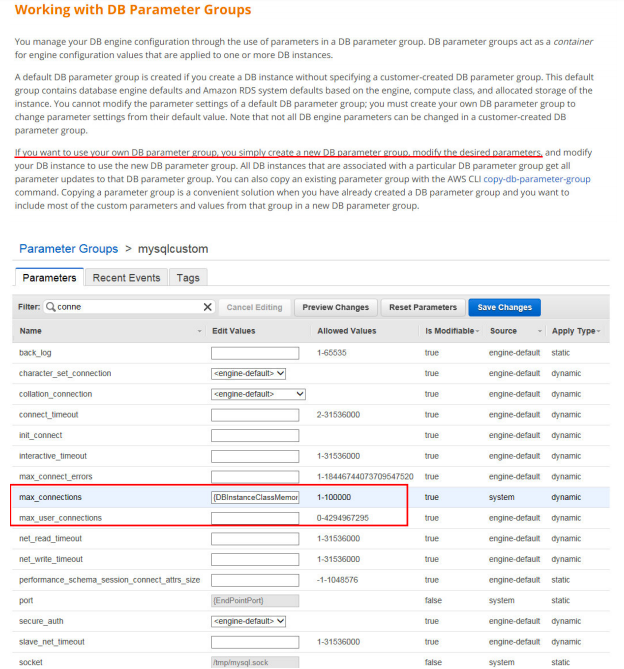 Create a new parameter group, attach it to DB instance and change the setting. C. Create a new option group, attach it to DB instance and change the setting. D. Modify setting in default options group attached to DB instance. A. Use Instance user data for shell scripts. B. Use Instance metadata for shell scripts. 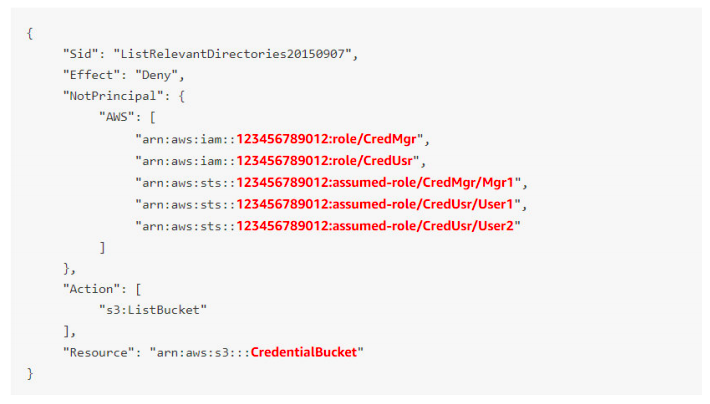 C. Use AutoScaling Group lifecycle hooks and trigger AWS Lambda function through CloudWatch events. 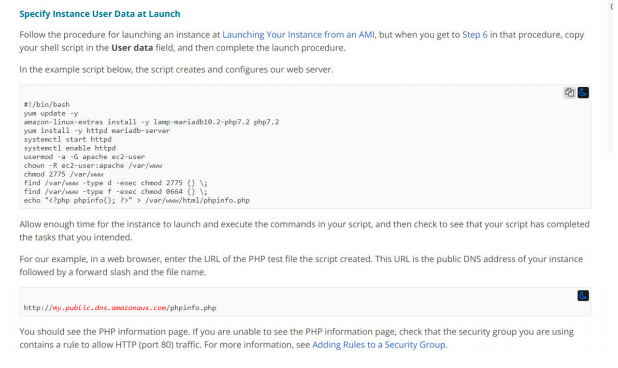 D. Use Placement Groups and set “InstanceLaunch” state to trigger AWS Lambda functions. 9. 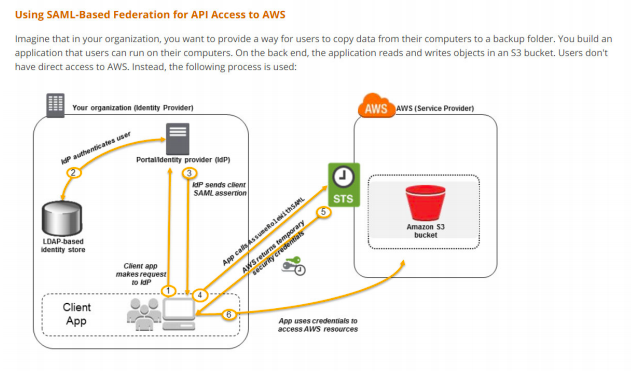 Your organization has an AWS setup and planning to build Single Sign-On for users to authenticate with on-premise Microsoft Active Directory Federation Services (ADFS) and let users log in to AWS console using AWS STS Enterprise Identity Federation. Which of the following service do you need to call from AWS STS service after you authenticate with your on-premise? 10. How many VPCs can an Internet Gateway be attached to at any given time? D. By default 1. But it can be attached to any VPC peered with its belonging VPC. At any given time, an Internet Gateway can be attached to only one VPC. It can be detached from the VPC and be used for another VPC. 11. Your organization was planning to develop a web application on AWS EC2. Application admin was tasked to perform AWS setup required to spin EC2 instance inside an existing private VPC. He/she has created a subnet and wants to ensure no other subnets in the VPC can communicate with your subnet except for the specific IP address. So he/she created a new route table and associated with the new subnet. When he/she was trying to delete the route with the target as local, there is no option to delete the route. What could have caused this behavior? A. Policy attached to IAM user does not have access to remove routes. B. A route with the target as local cannot be deleted. C. You cannot add/delete routes when associated with the subnet. Remove associated, add/delete routes and associate again with the subnet. D. There must be at least one route on the route table. Add a new route to enable delete option on existing routes. Option A is snapshot based data backup solution. 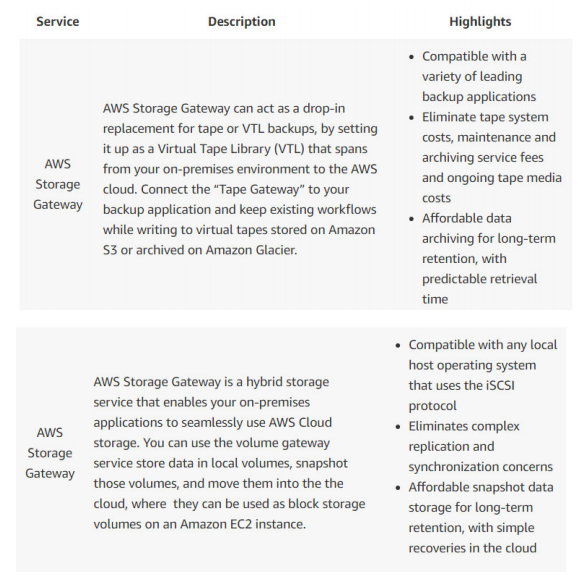 Option B, AWS Storage Gateway provides multiple solutions for backup & recovery. 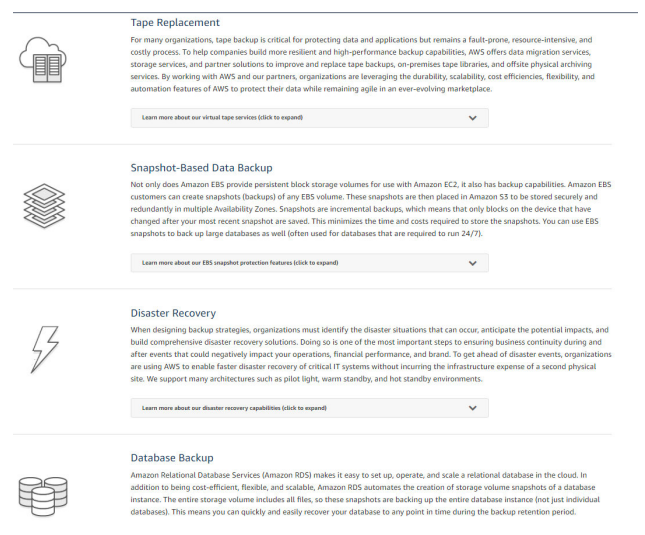 Option D can be used as a Database backup solution. 13. Organization ABC has a requirement to send emails to multiple users from their application deployed on EC2 instance in a private VPC. Email receivers will not be IAM users. You have decided to use AWS Simple Email Service and configured from email address. You are using AWS SES API to send emails from your EC2 instance to multiple users. However, email sending getting failed. Which of the following options could be the reason? A. 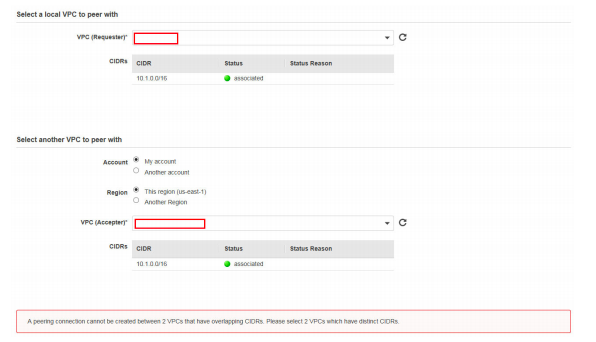 You have not created VPC endpoint for SES service and configured in the route table. 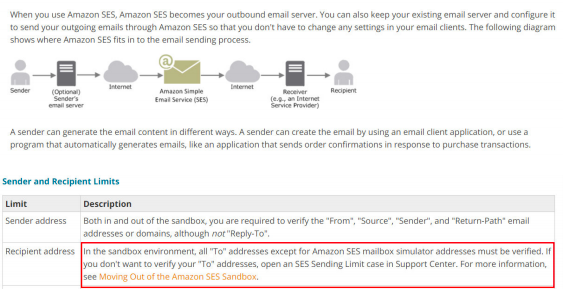 B. AWS SES is in sandbox mode by default which can send emails only to verified email addresses. C. IAM user of configured from email address does not have access AWS SES to send emails. D. AWS SES cannot send emails to addresses which are not configured as IAM users. You have to use the SMTP service provided by AWS. Amazon SES is an email platform that provides an easy, cost-effective way for you to send and receive email using your own email addresses and domains. For example, you can send marketing emails such as special offers, transactional emails such as order confirmations, and other types of correspondence such as newsletters. When you use Amazon SES to receive mail, you can develop software solutions such as email autoresponders, email unsubscribe systems and applications that generate customer support tickets from incoming emails. 14. You have configured AWS S3 event notification to send a message to AWS Simple Queue Service whenever an object is deleted. You are performing ReceiveMessage API operation on the AWS SQS queue to receive the S3 delete object message onto AWS EC2 instance. For any successful message operations, you are deleting them from the queue. For failed operations, you are not deleting the messages. You have developed a retry mechanism which reruns the application every 5 minutes for failed RecieveMessage operations. However, you are not receiving the messages again during the rerun. What could have caused this? B. You are using Long Polling which does not guarantee message delivery. C. Failed RecieveMessage queue messages are automatically sent to Dead Letter Queues. You need to RecieveMessage from Dead Letter Queue for failed retries. 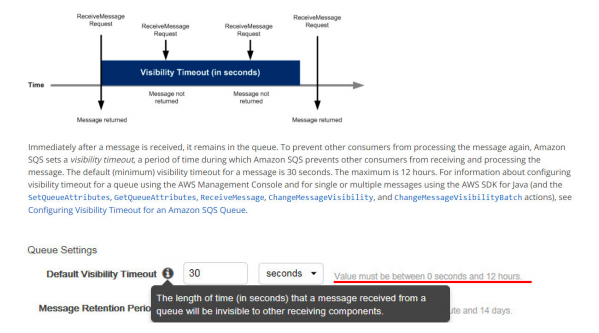 D. Visibility Timeout on the SQS queue is set to 10 minutes. Answer: D When a consumer receives and processes a message from a queue, the message remains in the queue. Amazon SQS doesn’t automatically delete the message. 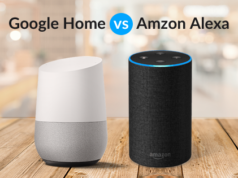 Because Amazon SQS is a distributed system, there’s no guarantee that the consumer actually receives the message (for example, due to a connectivity issue, or due to an issue in the consumer application). Thus, the consumer must delete the message from the queue after receiving and processing it. 15. You had set up an internal HTTP(S) Elastic Load Balancer to route requests to two EC2 instances inside a private VPC. However, one of the target EC2 instance is showing Unhealthy status. Which of the following options could not be a reason for this? A. Port 80/443 is not allowed on EC2 instance’s Security Group from the load balancer. B. An EC2 instance is in different availability zones than load balancer. C. The ping path does not exist on the EC2 instance. 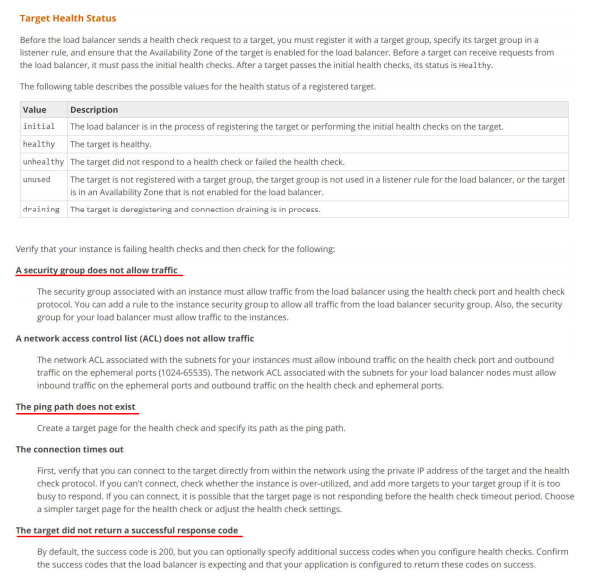 If a target is taking longer than expected to enter the InService state, it might be failing health checks. Your target is not in service until it passes one health check. 16. Your organization has an existing VPC setup and has a requirement to route any traffic going from VPC to AWS S3 bucket through AWS internal network. So they have created VPC endpoint for S3 and configured to allow traffic for S3 buckets. The application you are developing involves sending traffic to AWS S3 bucket from VPC for which you planned to use a similar approach. 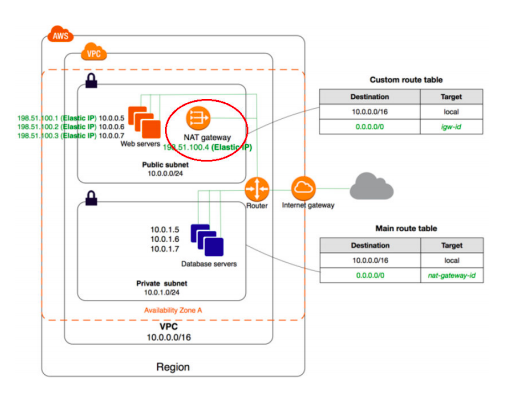 You have created a new route table, added route to VPC endpoint and associated route table with your new subnet. However, when you are trying to send a request from EC2 to S3 bucket using AWS CLI, the request is getting failed with 403 access denied errors. What could be causing the failure? 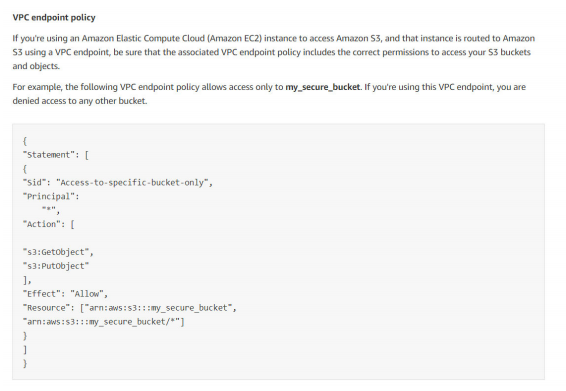 A. AWS S3 bucket is in the different region than your VPC. B. EC2 security group outbound rules not allowing traffic to S3 prefix list. C. VPC endpoint might have a restrictive policy and does not contain the new S3 bucket. D. S3 bucket CORS configuration does not have EC2 instance as the origin. Option A is not correct. The question states “403 access denied”. 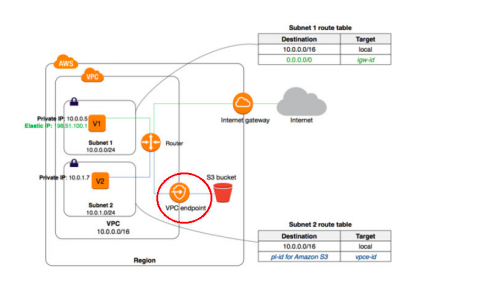 If the S3 bucket is in a different region than VPC, the request looks for a route with NAT Gateway or Internet Gateway. If exists, the request goes through the internet to S3. If does not exist, the request gets failed with connection refused or connection timed out. Not with an error “403 access denied”. Option B is not correct. Same as above, when the security group does not allow traffic, the failure cause will be 403 access denied. Option D is not correct. Cross-origin resource sharing (CORS) defines a way for client web applications that are loaded in one domain to interact with resources in a different domain. With CORS support, you can build rich client-side web applications with Amazon S3 and selectively allow cross-origin access to your Amazon S3 resources. In this case, the request is not coming from a web client. 17. You have launched an RDS instance with MySQL database with default configuration for your file sharing application to store all the transactional information. Due to security compliance, your organization wants to encrypt all the databases and storage on the cloud. They approached you to perform this activity on your MySQL RDS database. How can you achieve this? A. 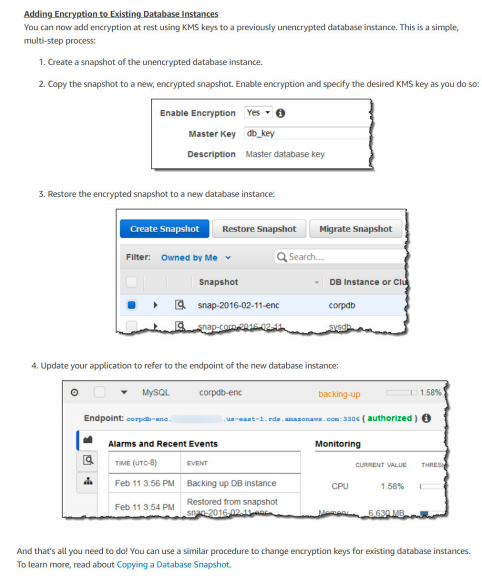 Copy snapshot from latest snapshot of your RDS instance, select encryption during copy and restore a new DB instance from the newly encrypted snapshot. B. Stop the RDS instance, modify and select encryption option. Start the RDS instance, it may take a while to start RDS instance as existing data is getting encrypted. C. Create a case with AWS support to enable encryption for your RDS instance. D. AWS RDS is a managed service and the data at rest in all RDS instances are encrypted by default. 18. Which of the following is an AWS component which consumes resources from your VPC? Option A is not correct. An internet gateway is an AWS component which sits outside of your VPC does not consume any resources from your VPC. Option B is not correct. Endpoints are virtual devices. They are horizontally scaled, redundant, and highly available VPC components that allow communication between instances in your VPC and services without imposing availability risks or bandwidth constraints on your network traffic. An Elastic IP address is a static, public IPv4 address designed for dynamic cloud computing. You can associate an Elastic IP address with any instance or network interface for any VPC in your account. With an Elastic IP address, you can mask the failure of an instance by rapidly remapping the address to another instance in your VPC. They do not belong to a single VPC. To create a NAT gateway, you must specify the public subnet in which the NAT gateway should reside. For more information about public and private subnets, see Subnet Routing. You must also specify an Elastic IP address to associate with the NAT gateway when you create it. After you’ve created a NAT gateway, you must update the route table associated with one or more of your private subnets to point Internet-bound traffic to the NAT gateway. This enables instances in your private subnets to communicate with the internet. 19. You have successfully set up a VPC peering connection in your account between two VPCs – VPC A and VPC B, each in a different region. When you are trying to make a request from VPC A to VPC B, request getting failed. Which of the following could be a reason? B. CIDR blocks of both VPCs might be overlapping. C. Routes not configured in route tables for peering connections. D. VPC A security group default outbound rules not allowing traffic to VPC B IP range. Option A is not correct. Cross region VPC peering is supported in AWS. When the VPC IP CIDR blocks are overlapping, you cannot create a peering connection. Question states the peering connection was successful. To send private IPv4 traffic from your instance to an instance in a peer VPC, you must add a route to the route table that’s associated with your subnet in which your instance resides. The route points to the CIDR block (or portion of the CIDR block) of the peer VPC in the VPC peering connection. A security group’s default outbound rule allows all traffic going out from the resources attached to the security group. A. In a Network ACL, for a successful HTTPS connection, add an inbound rule with HTTPS type, IP range in source and ALLOW traffic. B. In a Network ACL, for a successful HTTPS connection, you must add an inbound rule and outbound rule with HTTPS type, IP range in source and destination respectively and ALLOW traffic. C. In a Security Group, for a successful HTTPS connection, add an inbound rule with HTTPS type and IP range in the source. D. In a Security Group, for a successful HTTPS connection, you must add an inbound rule and outbound rule with HTTPS type, IP range in source and destination respectively. Security groups are stateful — if you send a request from your instance, the response traffic for that request is allowed to flow in regardless of inbound security group rules. Responses to allowed inbound traffic are allowed to flow out, regardless of outbound rules. Network ACLs are stateless; responses to allowed inbound traffic are subject to the rules for outbound traffic (and vice versa). Option A is not correct. NACL must have an outbound rule defined for a successful connection due to its stateless nature. Configuring an inbound rule in security group is enough for a successful connection due to is stateful nature. Configuring an outbound rule for incoming connection is not required in security groups. Selection of good books is important while preparing for the AWS Solutions Architect Associate exam. Check out the list of the Best Books for AWS Certified Solutions Architect Exam now! So, here we’ve presented 20 Free AWS Solutions Architect exam questions for the Associate-level exam. Definitely, these AWS CSAA practice questions would have helped you to check your preparation level and boost your confidence for the exam. We at Whizlabs are aimed to prepare you for the AWS Certified Solutions Architect Associate exam (SAA-C01). So, we offer 25 more AWS Certified Solutions Architect Associate Exam FREE Questions and AWS Certified Solutions Architect Associate Practice Exam with 988 unique questions that you can try to get prepared for the exam. Practicing through a number of practice questions make you confident enough to pass the certification exam in the first attempt. Still thinking? Start practice and get certified! Need any help in AWS Certified Solutions Architect exam preparation? Just put in the comment section below or submit in Whizlabs Helpdesk, we’ll be happy to help you! Sorry but are you sure these questions are from the CSAA exam? If they are then the Wizlabs and the practice exams from AWS are both completely different! These questions do look more like the ones you would get in the CSAP?? If there ARE then Wizlabs questions are completely wrong in complexity and format for the CSAA exam! very well articulated. Answer to each question is justified with description from Amazon documentation. Very informative and good reference materiel for exam preparation. We intentionally add little more complexity to the practice questions so that when you face real exam, you will find it easier. This will also help you prepare well for the real exam. In terms of format, we would greatly appreciate which specific questions do find different. Well explained. Look forward to have more sets like this. It will really help to prepare for the exam. @Gagan No, it is not. You still need to create AMI from encrypted snapshot. When creating new EC2 instance from predefined images, you can’t choose root volume encryption. yes, it is very helpful.. pls guide me to complete the exam..
I’m about to take this exam, I’ve practiced following the link you’ve shared above. Just wondering if this still actual and reflect the update version of CSA Associate ? If you have gone through the practice tests and whizlabs and scored 85-90% in all practice tests, then i think you are ready to take the exam.